From 01.11.2017 – 01.13.2018 the KRAVolution Kids Instructor Course will take place, guided by the Israeli expert Haim Sasson! This course is not only for active instructors, but also for assistants – (prospective) instructor who enjoy entertaining children in effective self-defense. 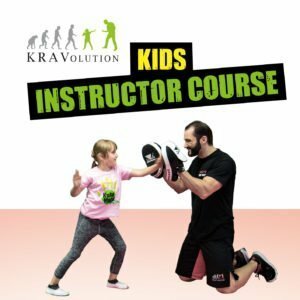 The KRAVolution KIC offers unique and valuable skills to the participants in an area of great importance – self-defense for children in a safe and playful environment. The course provides participants with correct and successful guidance of children, which are very different from teaching adults. The course will make the instructor a multisector-instructor with high communication skills with children and their parents. This contributes enormously to the satisfaction, since the instructor sets important basic skills of self-defense early (in the development phase). Skills children sometimes need even more than adults. The great advantage of this course is also that techniques are split into the smallest checkpoints and these are taught playfully. Then you will see the techniques with different eyes and realize how effectively and easily you can teach even more complex techniques didactically good. Your adult training will sustainably improve positively. There are few Krav Maga experts who have the martial arts knowledge that Haim Sasson has. Over 40 years of Martial Arts, Krav Maga Black Belt by Imi, Black Belt in other systems, and a Wingate Institute trainer. Haim Sasson’s expertise covers all areas of Krav Maga, especially civilians, women and children. Haim manages his own organization, called IKM, and trains with the best in the field, including his martial arts master Jim Keenan, Krav Magas founder Imi Lichtenfeld, Imi’s closest students and instructors, and Israeli Defense Forces during his time as an officer in the army. We are very proud that Haim is a cooperation partner of KRAVolution, because Haim is responsible for our KIDS-Instructor courses. Haim has travelled the world as one of the most respected global instructors and created the Dynamight Kids safety and self-defence program that is delivered throughout Australia and now through the KRAVolution Instructors! – Realize yourself as an instructor by teaching children self-defense abilities, promoting qualities such as self-confidence, courage, self-control, education, etc. – Children are the future of Krav Maga, the future instructors of your club! You need an impeccable certificate of good conduct. We do not want to teach those, we want tob e protected for. We reserve the denial of participants, we think are not suitable. Needless to say, you will get you money back then.